You can save a significant amount of time and achieve better results by sending out blog alerts to your subscribers instead of newsletters. Virtually the only condition for sending blog alerts is having a blog. A blog alert is an email which is automatically sent to your subscribers whenever you publish a new blog post. To set up this blog alert with SalesAutopilot, you simply have to create an email (the blog alert template) and assign a delivery schedule to it. 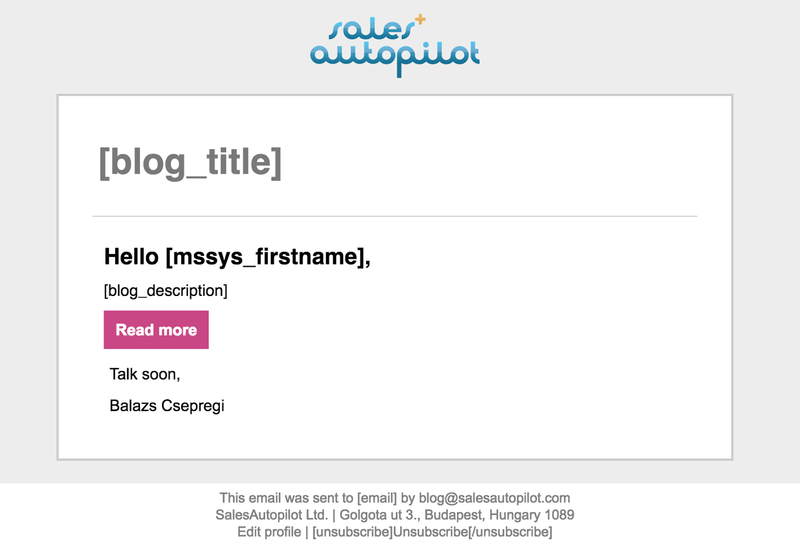 Then, whenever you publish something new on your blog, SalesAutopilot will automatically place the title and a brief introduction to the blog post in the blog alert template and then send the email to the selected list. Blog alerts have a number of features which, in many cases, make them more effective than newsletters. It takes less time to use them. For most people, it takes less time to create a blog post, than creating an HTML email with its plain text version and assigning the right delivery schedule to it. Maybe that will only save you 20 minutes per blog post (weekly, bi-weekly, monthly), but that's not at all insignificant to a busy marketing manager or executive officer. You can automatically reach social media with it. SalesAutopilot's blog alert settings allow you to automatically post the intro of the blog post on Facebook and its title on Twitter. You can use it as your own media. This means a number of things. For one, you can use it for advertising. It's much more accepted for a blog alert than it is for a newsletter to display several design elements, and thus you can get very creative and stylish with how you present your ads. Moreover, if you run your own blog, you can enter into a partnership with other bloggers and thus make more appearances and reach more people for your lists.